I decided to bake an experiment. I made the identical cookie recipe (one of my favorites) using two different unsweetened cocoas. The first, Cacao Di Pernigotti, from Italy, I bought with a $22.95 credit from Williams Sonoma. I know, I gasped, too--12 oz. for $22.95. I remember my friend, owner of Perfect Endings, Sam Godfrey, one of the best bakers I know, telling me that it is the gold standard. When I couldn't find anything else I wanted for that price, I took a big gulp and decided to go for it. The second cocoa I used was my old standby, Ghirardelli. If you take a look at the photo, it is pretty obvious that the two cookies did not come out the same. The taste, texture and color were all different. 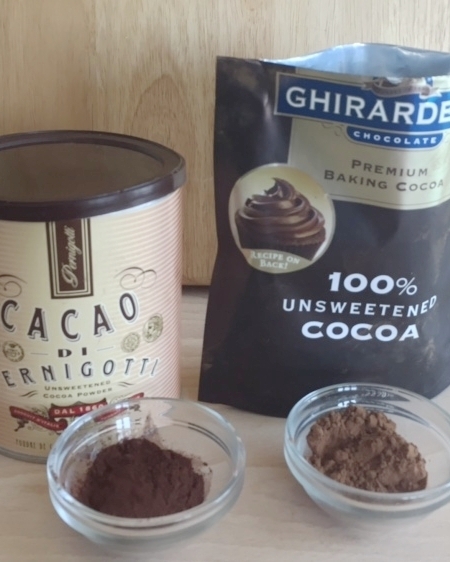 Before I began baking with the cocoas, I tested one tablespoon of each in one tablespoon of water. The Pernigotti came out as thick as fudge sauce, whereas the Ghiradelli didn't thicken at all. That was a big clue, which I should have caught. If I wanted to bake with the richer cocoa, I should have used less of it. The difference: The cookies made with Pernigotti came our darker and were denser, chewier and had an intense chocolate flavor that left a slight bitter taste in the back of my palate. The cookies made with Ghiradelli were softer and creamier, lighter in color, with a pleasant, up-front chocolate taste. They also baked into a more consistent shape. So, what happened? The difference between the two cocoas lies in the processing. Perginotti is a much richer and deeper cocoa with more cacoa (raw beans) in it. My daughter Cheryl and I preferred the cookies made with the Ghirardelli. The original recipe was developed using an everyday cocoa like Hershey's, Ghiradelli or Droste. If I want to use Pernigotti in a recipe that is written for one of those popular cocoas, then I need to use less of it. I'm sure this will not be an unhappy conclusion for you, because I doubt that you want to run out to Williams Sonoma to spend almost $23 on cocoa. Right? Whichever moderately priced cocoa you choose to use, you will end up with chocolate cookies that are so deliciously creamy and delightfully crunchy that you will be proud to serve them. Preheat oven to 350°. Line 2 baking sheets with parchment paper or silicone mats. In a mixing bowl with electric mixer, mix the sugar, cocoa and flour. Add the egg whites and beat at high speed for one minute. On low speed, mix in the pecans. Using an ice cream scoop or tablespoon, drop 1-½ tablespoons of batter 2-inches apart onto the baking sheets. Press lightly on the tops to flatten them slightly. Bake for 15 minutes or until set. Cool completely before removing from the paper. MAKE AHEAD: Cookies may be stored airtight for several days. They also freeze well. The darker cookies were made with Cacao di Pernigotti. The lighter ones with Ghirardelli. Note the difference in the colors between the Cacao Di Pernigotti and Ghirardelli cocoa.. I often use a Silpat in place of parchment to line the baking sheet. The easiest way to drop the cookies is with a small ice cream scoop or meatball scoop..